Roadside Assistance Near Me--Milliken: What is Roadside Assistance? Roadside assistance is a service usually provided by a towing company to assist drivers whose vehicle (light-duty, heavy-duty, motorcycle, car, or truck) has broken down by the side of the road. 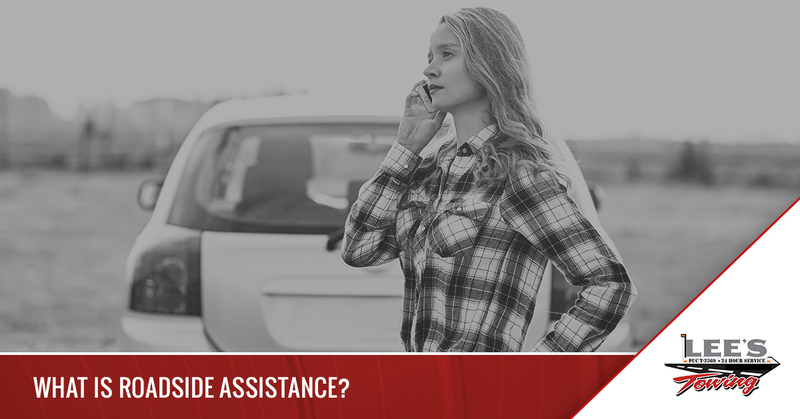 Roadside assistance is usually an optional coverage offered by your auto insurance and can include different services, depending on options available. Lee’s Towing, which serves Fort Collins, CO, offers the best roadside assistance in Northern Colorado and the Wheatland, WY, areas. Contact us today for all of your emergency towing needs. Towing. Most insurance companies will cover a tow truck within a certain distance. If you’re in the middle of nowhere, your car would be towed to the nearest service station. If you are travelling and want your car delivered further than the service area, you will most likely have an additional charge assessed. Battery service. Batteries go dead. Your car will not run without a battery to feed the starter to start the engine. Otherwise known as a jump start, using another vehicle, you can use someone else’s battery to recharge your battery, at least long enough for you to start your engine. Most likely, you will need a new battery. This service can be provided by a nice person as well who may stop and assist you. This is why jumper cables are important to have on hand for emergencies (whether your own or someone else’s). Do note: electric cars work differently and don’t take a traditional jump start. Hybrid vehicles fall into the same category, which shouldn’t need a jump-start because they use the battery which powers the electric motor to turn over the gasoline engine. Flat tires. Depending on your insurance provider and your roadside assistance package, some will send out a service professional to fix your flat tire for you by the roadside or will have you tow your vehicle to an automotive repair shop for the tire fix. Unfortunately, most roadside assistance programs don’t offer tire repair services for motorcycles. Lockout service. If you locked your keys in the car, most roadside assistance programs will send out a locksmith to allow you to gain entry to your vehicle. Be aware that some service professionals are not locksmiths that insurance companies employ. Hence, there may be a separate charge for a locksmith who most likely is not contracted with the insurance company for payment. Luckily, with keyless entry and smart keys, this is a rarer occurrence than it used to be. Fuel delivery service. If your vehicle won’t run because you ran out of gas, roadside assistance may provide for fuel delivery to your location. There may or may not be a charge for the fuel itself, depending on your policy. Extrication services. Extrication is when your vehicle is stuck and needs to be towed or winched out. This can be if you slide off the road during a snowstorm, you become stuck in the mud while off-roading (which may not be covered either due to the nature of your activity), or you run your vehicle off the side of a cliff and down an embankment. Lee’s Towing near Fort Collins, CO, works with most insurance companies to provide the best roadside assistance for our customers. If you don’t have roadside assistance with your car insurance, Lee’s Towing will provide roadside assistance at very reasonable prices. We understand the frustrations and stress being stranded by the side of the road can cause, from being late to work or being late to pick up your child from school. We prioritize our calls based on need and can get you to where you need to go quickly. Lee’s Towing also offers light duty towing as well as most other towing services, such as impound services or heavy-duty towing services. Contact us today for all of your roadside assistance needs!